Ask students: What are some of the most important things you can do as a family or with your future children? Brainstorm at least 5 ideas. Share and briefly discuss ideas. Hopefully, “Eating Dinner Together as a Family” was shared. If not, ask students what they think about it and if it should be included. Survey students as to the frequency of how often their own family eats together and discuss obstacles that may interfere. 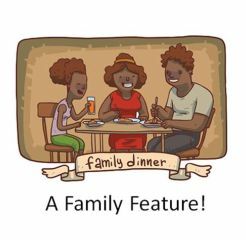 Ask students to think about their own family meals as they view this PSA and write down similarities and differences as they relate to their family’s dinners! Share as a group. Let’s explore why this time spent together is so important! After students have individually completed the graphic organizer, have them form small groups (preferably 2-3 students) and share their findings with each other. Use all of the info to create a small group (2-3 people) Family Feature iMovie Trailer project titled, “Family Dinner Matters. The feature should include information from all group members, appropriate images and music. These will be used to promote the importance of family meal time. We use iMovie as we are 1:1 with iPads and use the pre-made trailer templates because they are easy to use. As a review and evaluation, students will share their group’s trailers with the class. The audience will complete a peer evaluation for the family dinner trailer using the provided guide sheet. Depending on the size of your class, you may want all students to watch the trailers but only complete a peer evaluation on one groups’ video. This keeps everyone engaged in looking for the content criteria, but only has each student filling out one form. I often grade the rubrics as I’m viewing and if I need to clarify something, I go back and review on my own. As a concluding activity, to reinforce the findings that students researched in the importance of family meals, have them view the Ted Talk titled, “The Importance of Family Mealtime”. There are a couple of questions that could be assigned if needed and they can be found in the attachments below. ← Groceries to Your Door: Compare & Contrast–Convenience Worth the Cost?